Allevyn Adhesive provides the advantages of Allevyn hydrocellular dressings in a self-adhesive format for simple and effective fixation. 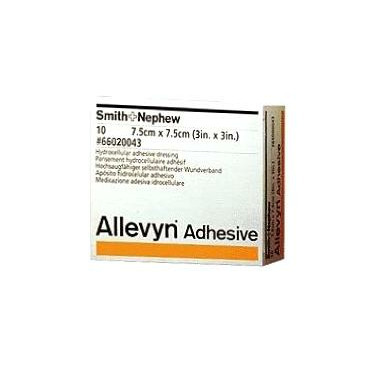 Convenient adhesive presentation - The wound contact layer of Allevyn Adhesive is coated with a low allergy adhesive which is designed to adhere well to intact skin, but not to wounds. The adhesive has a proven low risk of skin irritation. Wound Management by secondary intention on chronic and acute, full thickness or partial thickness or shallow granulating, exuding wounds such as pressure ulcers, leg ulcers, infected wounds, diabetic foot ulcers, malignant wounds, surgical wounds, first and second degree burns, donor sites and fungating ulcers. Can be used in conjunction with IntraSite Gel for necrotic or sloughy wounds. Do not use any Allevyn product with oxidising agents such as hypochlorite solutions (eg Eusol) or hydrogen peroxide, as these can break down the absorbent polyurethane component of the dressings. If reddening or sensitization occur, discontinue use and consult a health care professional. Excellent product. Comes in many sizes. Not flimsy. Good coverage for a wound.